As you probably know by now, I love doing a bit of baking. In my last baking post I mentioned that I’d made a list of all the things I’d like to try and bake – it seems to grow every time I look at it, but I guess it means I’ll never run out of ideas of things to try! Next up on my list were red velvet cupcakes. I’ve actually tried to make them before but they didn’t turn out right and looked more like slightly odd chocolate cakes! So, I rooted around for another recipe to try, and came across this Hummingbird Bakery one. I’ve heard great things about this particular bakery, and am dying to go to one of their shops to try some cake, so I thought it would be a good place to start. Happy Baking! Preheat the oven to 170C/325F/Gas Mark 3 and line a cupcake tray with cases. Mix together the butter and sugar. Beat until light and fluffy. Slowly add the egg and beat until everything is well incorporated. In a separate bowl, mix together the cocoa powder, red food colouring and vanilla extract to make a thick, dark paste. Add to the butter mixture and mix thoroughly until evenly combined and coloured. Slowly pour in half the buttermilk, beat until well mixed, then add half the flour, and beat until everything is well incorporated. Repeat this process until all the buttermilk and flour have been added. Beat until you have a smooth, even mixture. 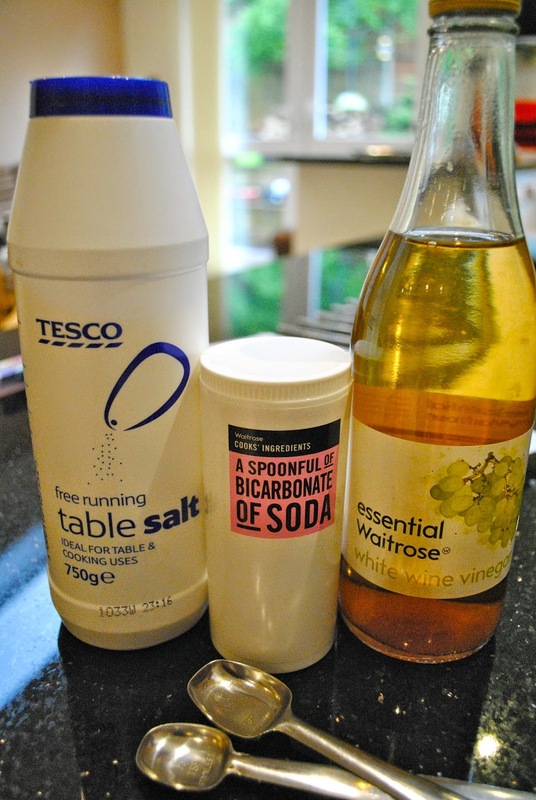 Add the salt, bicarbonate of soda and vinegar and beat until well mixed. Spoon the mixture into the paper cases until two-thirds full and bake in the preheated oven for 20-25 minutes, or until the sponge bounces back when touched. A skewer inserted in the centre should come out clean. Meanwhile, for the cream cheese frosting: Beat the icing sugar and butter together until the mixture comes together and is well mixed. We found it quite difficult to get a light and fluffy mixture here, so you may find it helpful to add the cream cheese and then beat again until your mixture is light and fluffy. Do not overbeat, as it can quickly become runny. When the cupcakes are cold, spoon over the cream cheese frosting on top, swirling gentle with the tip of a spoon. Sprinkle with your choice of topping, and enjoy! 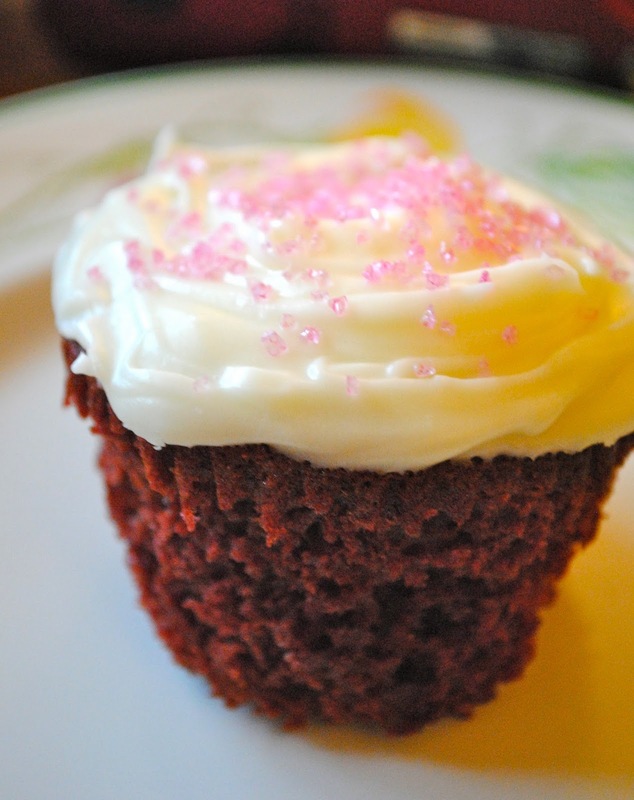 Have you made Red Velvet cupcakes before? Or do you have another recipe you’d like to share with me? Those look very pretty and the instructions are so clear. Thanks! Ooh these look so tasty! Great recipe lovely!